Anyway, it seems that they recently finished refurbishing the trails through this tract, and asked artist Jon Cotner, the author of the piece, to “do something poetry-related on site” in conjuction with the Poetry Society of America. He wanted something that would actively engage visitors and lead them to pay closer attention to the forest around them. So I “installed” 15 lines pulled from 2,500 years of poetry along a trail through the old-growth forest. Visitors spoke each line (printed on a handout) at specific locations (marked by small orange signs) to which the lines corresponded conceptually or physically. For example, near the start of the self-guided walk, people would recite Pythagoras’s maxim “The wind is blowing; adore the wind” to clear their heads. Or just as the Bronx River came into view, people would recite Gary Snyder’s verse “Under the trees/ under the clouds/ by the river” to grow closer to the landscape. At the final spot, above a waterfall, people said Ch’u Ch’uang’s “Waterfalls, with a sound/ Like rain” to sharpen the auditory sensation. Walking Poem Forest took about 20 minutes. Several participants had long histories with the Garden. They felt surprised by how intimately they encountered a landscape that had seemed “familiar” or “known.” A bench near the waterfall became an informal classroom, where we discussed their experience. The overwhelming message was that the poetic lines encouraged everyone to slow down, to see and sense more clearly, to inhabit the present more deeply, and to fill with enchantment. The post includes photos of each spot, evidently taken in November, paired with the corresponding quote. There’s also an audio compliation of visitors reading the lines. Pretty cool! Gillian from treeaware blog visited New York City over the holidays, and has a stunning series of photos of trees decked out in lights, “turning the streets into fairyland.” She also takes a look around Central Park, and throws in a couple of photos from February 2011 when it was considerably more wintry to show the contrast. Go look. Did you know that Manhattan’s Washington Square Park had its own blog? Me neither. But the Washington Square Park Blog appears to be a fine exemplar of “hyper-local citizen journalism,” at least by evidenced by a recent post about artist Kristin Jones’ plan for a tree-focused “artistic intervention” on Arbor Day 2013. 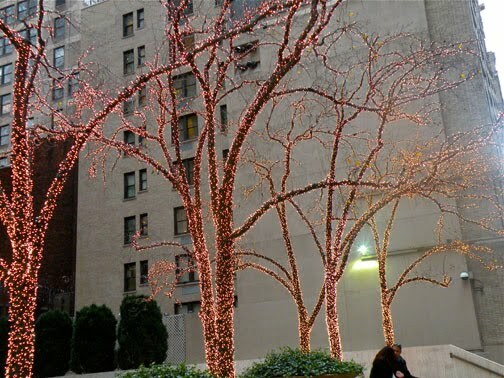 One tree in each borough of NYC would be designated as the focus of a 24-hour multimedia extravanganza. The tree she has her eye on for Manhattan is at Washington Square – the famous “Hangman’s Elm” (there seems to be dispute over whether it was actually used for hangings) in the NorthWest corner of the park. I did not realize that tree is 330 years old! Incredible. Jones and her partner were responsible for “Metronome” – the unique clock (or “artwork/digital timepiece, intended as a modernist meditation on the dissolution of time”) that looms above Union Square on 14th Street.